Prequels in modern entertainment find themselves in an unenviable position: they don’t continue the story that generated all of the excitement of the original and they often face the impossible task of living up to hype that can be difficult, if not impossible, to overcome. Episode One: The Phantom Menace will forever be tarnished, not for being a horrible movie, (which it is) but for failing to meet the expectations of millions of people who had anxiously waited almost two decades for a new chapter in the Star Wars franchise. Even if Phantom Menace had left Jar Jar Binks on the cutting-room floor, locked George Lucas in an oubliette and made a movie that on its own was good, even great, it would likely not have been enough to fulfill the dreams of a fandom with such lofty expectations, expectations that grow more nostalgic as times passes and the original focus of their attention resides concentrated on a pedestal protected by a shield of nostalgia that criticism or objectivity can only penetrate with utmost difficulty. Homeworld: Deserts of Kharak is a prequel that finds itself in a similar position to The Phantom Menace. The original Homeworld released in 1999, during a time when RTS games had saturated the market and PC gaming was entering a renaissance era of graphical prowess and an increased scope in what games could offer. Homeworld set itself to the task of working Pentium IIs and Voodoo video cards to their limit, and the praise and adulation from the press and fans for the cinematic and tactical masterpiece was well deserved. Looking pretty epic over here! These early announcements were soon followed by an enigmatic trailer, that while it didn’t show any concrete gameplay footage, did inspire the imagination and hinted at a truly epic game in the making. I know I was excited, especially with the inability to revisit the original games at the time due them not being available for digital purchase, an issue Gearbox rectified in 2015 with a HD remaster. Not much was heard about Hardware: Shipbreakers until Gearbox secured the rights to the Homeworld after THQ’s bankruptcy and announced that Blackbird Interactive’s Hardware: Shipbreaker would be an official entry into the Homeworld series, the first one in over a decade. After this announcement Blackbird and Gearbox went silent, with only a peep coming up here or there, until the news in December of 2015 that Homeworld: Deserts of Kharak would be released in January of 2016. And now, here we are: The silence has been broken, the veil lifted. Does Kharak meet the expectations of Homeworld’s reverent, cultish fans? Does Kharak offer a truly epic experience of scale where “the vehicles are huge and getting huge-er…with a planet-scale map that you can spend hours travelling across?” Does Kharak succeed in breaking the curse that seems to befall prequels of a fan-loved franchise that arrive long after the original work? Or, more importantly, is Kharak, on its own, a game that can be judged on its individual merits, divorced of unreasonable and lofty presumptions? Let’s answer the last question first: Yes, Kharak is a good game. Blackbird Interactive did not depart too far from the original formula with Kharak. There’s a competent RTS campaign joined with an above average narrative delivered through beautiful art, cinematic cut scenes and a score that compels you to keep advancing through the campaign. The biggest difference in Kharak is the actual gameplay itself. Unlike Homeworld, which takes place entirely in space and allows free movement in all three dimensions. This freedom of movement and the focus on managing grouped units was one of the main elements that set Homeworld apart from the other RTS games of its time. Kharak, being set on…well, Kharak, does not allow three dimensional movement. Kharak is a conventional RTS in every regard, with some important exceptions. There is no base-building in the traditional sense. Your base, the Kapisi, is essentially an aircraft carrier with wheels. The Kapisi handles all research upgrades and unit production. It’s heavily armored and has strong defensive and offensive capabilities. However, the trade off is that it is very slow and hard to maneuver; many situations in the campaign and in map design keep the Kapisi on the periphery of engagements or out of combat all together. The focus in Kharak is not on ramping up resources for a major conflict, but in deliberate, pre-determined tactical encounters. Resource gathering is present, but it is also limited. The “shipbreaking” conceit shows itself here; the majority of resources are gathered from derelict wrecks that decorate the landscape of sweeping dunes and oceans of sand that make up the majority of Kharak’s maps. These hulks must be broken apart with demolition charges and then scavenged for resources used for research upgrades and unit production. Occasionally an artifact will be uncovered, which is basically just an upgrade to an ability or unit. Scavenge the massive hulks of alien space craft for ability upgrades. Seems counter-intuitive, but just go with it. Unit variety is limited, and units themselves fall into a familiar “triangle” type of balance. Light attack vehicles have great mobility and speed and are excellent for taking out the slow but long-ranged light rail artillery. Armored assault vehicles crush the light attack vehicles with ease but find themselves helpless against the range and firepower of light rail units. These three units form the core of your force. Indirect areal support can be launched from carriers to strafe and carpet-bomb targets, but aircraft find themselves at the mercy of mobile missile batteries. Support units consist of cruisers, which are slow but essential for their ability to repair in the field, baserunners which are are used for scouting via ground and aerial sensors and laying down stationary turrets and anti-air turrets. In addition to Kapisi, you also have the singular unit of Rachel S’jet’s sandcrawler, a slow moving research vehicle that players will use almost exclusively to break apart alien ships for resources and artifacts, as well as her ability to supplement the repair tasks of cruisers. If Rachel or the Kapisi perish, it’s game over. Protecting Rachel and the Kapisi aren’t necessarily where most of your attention will go when playing Kharak. That will be reserved for your units in the trenches; your cruiser that you painstakingly managed to get to level 3, despite its lack of direct contribution to fights, and hence crippled ability to gain experience. All of your “generic” units gain experience, and with that experience gain they are gifted associated buffs as they climb up the levels. This adds a huge amount of tension into the campaign and was my favorite element. But if you lose these units…and that can be very easy to do, since micromanagement is not an easy task in Kharak…they are gone forever. Micro management does become an issue in Kharak. For various reasons, the most significant being the way the game forces you to play, units will be controlled in groups set to hotkeys. This is great for moving in a squad of light attack vehicles to strike at the center of a mass of rail guns, but not so much fun when your highest level armored assault vehicle is the subject of concentrated fire and you have no way to save him (besides a reload, which I did more than once! My units are Highlanders!). The slow movement speeds and difficulty in selecting individual units on the fly from the chaotic mess of your combined forces make precise micromanagement a challenge that is almost impossible to overcome. The speeds of movement, which do feel relatively slow, and the size of units, which do feel fairly small, can be chalked up to the “size” of the maps, but that is an illusion. The reality is that units are hard to maneuver, control and micromanage, and this is a major insult in any RTS, not to mention one with Kharak’s pedigree. Ignore the videos and screenshots showing the large models and great sense of detail. This IS how you will play 98 percent of Kharak. Despite the early vision for Kharak…an emphasis on epic scaling of maps and units, breaking through the established RTS paradigm…it didn’t happen. The maps in Kharak are actually quite large, but due to the way campaigns are set up, speed differences in units and the way engagements play out, you will almost never have leisure time to zoom in to the battlefield to enjoy what is admittedly a very nice level of detail. What you will be looking at the majority of the time is a zoomed out view, and the units look small, insignificant…and honestly boring. It feels like a major letdown, not just because of the initial promises, but because other games, such as Supreme Commander and even StarCraft 2 have done a much better job in the department of scale than Kharak has, and they precede this Homeworld prequel by almost a decade. There also isn’t a minimap, which feels gamebreaking at times. Whatever disappointments might be felt over a change in initial vision for Kharak, or it’s safe approach to RTS gameplay, or even way the use of scale actually backfires and creates the opposite effect, the other half of the game, the actual story…is very well done and it definitely is the strongest link to Homeworld. The story is conveyed through a cinematic narrative via cut-scenes between missions that showcase a beautiful and evocative vision of flotillas and factions maneuvering across a great barren desert sea to seize control of an artifact that represents religious compulsion for one side (the Gaalsiens, who I suspect are loosely modeled after a nomadic Islamic culture) and another group, a coalition of Kushan tribes, seeking a salvation and redemption from a technological marvel known as the Jaraci Object, which contains knowledge to either save their ravaged planet or offer a form of escape from its ruined surface. The second group’s protagonists, such as Chief Science Officer Rachel S’jet and her brother, Jacob S’jet, bear names from the wandering tribes of the the Old Testament. But Homeworld itself had a story and narrative that seemed to be strongly inspired by the Old Testament and other Abrahamic traditions (the book of Exodus comes to mind…), so don’t look at this as some sort of heavy-handed moralizing or commentary on modern politics. At best, the message of religious zealotry in conflict with the pursuit of knowledge can be taken on its face for what is; a narrative device with a cautionary moral element thrown in. Come for the gameplay, stay for the excellent story and beautiful cutscenes. The real joy of the story is in the beautiful..and I do mean beautiful…art work and cinematic direction of the cut scenes. The Kapisi lumbering across a wind-swept sea of sand, Gallseian hovercraft zooming across dunes, close ups of the mammoth derelicts…this is where Kharak comes the closest to meeting its original vision and carrying on the tradition started with Homeworld. 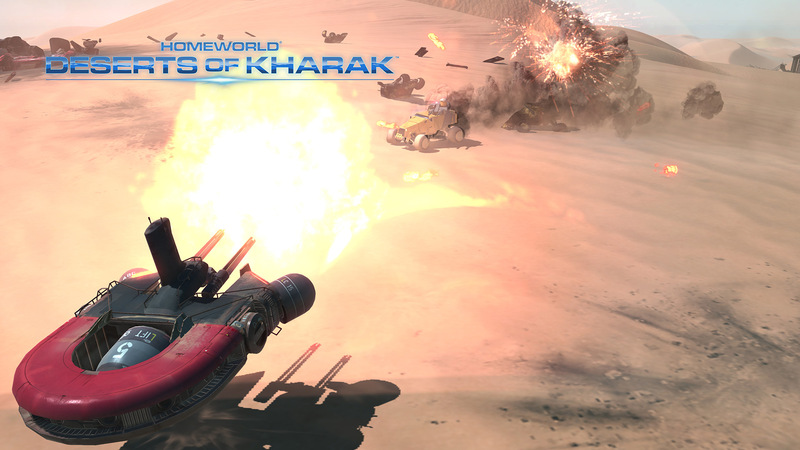 Paul Ruskay, the composer for all of the previous Homeworld games, returns to Kharak in grand fashion, and the sum total will drive players forward through the campaign to reach the end of Homeworld’s origin tale, and you can’t ask for much more in a story driven experience. A lesson I re-learned while playing Kharak is one I had forgotten going into the game and should have kept in mind from the beginning: You have to play and experience a game on its terms, not what you want it to be. If you are an old, decrepit gamer like myself and hoping that Kharak will recreate that sense of wonder and excitement you first experienced almost two decades ago with Homeworld: it won’t. It can’t. It was an experience born of time and place. If you play Kharak on its own terms, you will be playing a game built on a competent RTS base and decorated with cinematic experience. And the end result is a good, if not earth-moving, experience. Homeworld: Deserts of Kharak is definitely not the PC game analog to The Phantom Menace, but it’s also not the original Homeworld. And that’s ok.
A good, if not ground-breaking, tactical RTS accompanied by excellent story elements. Don't expect to recreate the magic of the original Homeworld 16 years ago and you won't be disappointed. Tags blackbird interactive Frank herbert would probably like this game homeworld homeworld: deserts of kharak RTS tactical where is the damn minimap?